Bognor had four central defenders on the pitch by the end of this absorbing West Sussex derby – while a fifth was seen on the hallowed turf soon after the whistle. The quartet were not on the field in a desperate attempt to stop Worthing claiming a point – this was more a case of the Rocks having little choice. It’s like that when 75 per cent of your subs’ bench play in that position. But in the final reckoning no number of defenders could save the Rocks as an injury-time free-kick – given very contentiously as Richard Gilot tried to fend off two opponents out wide – was swung into the box and fired in, via a defender’s boot, by Jesse Starkey. It was rough on the Rocks, who had led 2-0 with 16 minutes left and had been good value for that margin, only for a penalty – every bit as controversial as the later free-kick – to give Worthing a lifeline. There may have been contact between the ball and Harvey Whyte’s forearm but it was hard to see how it could be deemed deliberate, a point the Rocks camp were keen to make to the referee at the time and publicly afterwards. Ex-Rock James Crane converted the spot-kick to set up the tense finish, one the Rocks looked to have weathered before the stoppage-time drama. Many in the ground will have felt 2-2 was fair, for it was certainly a game of two halves. The first saw Bognor dominant most of the 45 minutes, at least after a sharp opening spell by the Mackerels. The Rocks found their feet and quick thinking by Lincoln set up a counter-attack in which Brad Lethbridge powered past his marker and into the box to square to Mason Walsh, who just had to tap it into an empty net. The home fans were in dreamland with just under a quarter of the game gone when Doug Tuck’s short pass in the box to Joe Tomlinson led to the defender turning and firing a low shot that Lucas Covolan should have saved but instead helped in. Lethbridge and Whyte both had half-chances to kill off the visitors before the break, but when the teams came back out, the momentum shifted. 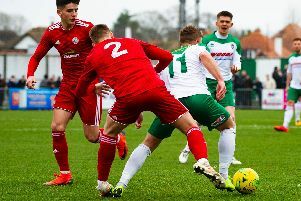 Worthing realised it was attack or lose and pushed Bognor back, the home side’s rearguard action not helped when they lost full-back Calvin Davies to another serious-looking knee injury. For all their possession, Worthing did little to test Lincoln before the penalty. When it was all over Worthing celebrated as if they’d won; Bognor looked like they’d lost. And that fifth centre-half, Gary Charman, was almost last to leave the pitch after congratulating his squad-mates on their efforts. A section of the away support did their best to spoil things with some stupid antics, but in truth most on both sides would have gone home half looking forward to the next El Classicoast.